I worked on a project with 170 Adobe Flash videos which were published as SWF files. These files were published prior to FLV becoming the norm, so all video and audio was contained within a each individual SWF. Programs such as Sothink’s SWF to Video Converter produced output files that had many audio sync issues. 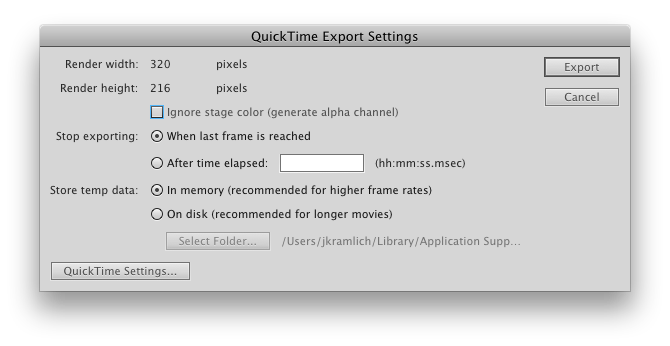 JSFL alone does not allow exporting to QuickTime movies. The solution was to use a combination of Sothink SWF Decompiler, JSFL, Automator for MacOSX and AppleScript. For this I used Sothink SWF Decompiler. It is available for both Windows and MacOS X. In this instance I actually used the Windows version because I had a license for it. Both Mac and Windows versions should have the option to batch an entire folder of SWF files and convert them into FLA. Unfortunately, the publish profile of the decompiled FLA’s was a bit off. There may be other ways to modify the default publish profile but I found a neat JSFL script from Grant Skinner to batch publish Flash files. I was able to modify it so that it imported a publish profile and then saved the resulting Flash file. These files were then used for the next batch. My modifications to his script can be found here. Apple’s Automator introduced a great new feature titled “Watch Me Do”. It’s intended to watch you interact with the keyboard and mouse and then be able to play back those actions. The trouble is, it doesn’t capture everything you do. For everything that it doesn’t capture, we will use AppleScript to fill in the blanks. Flash will remember the Export settings and use them for the next file you export. Make sure you have them set properly and click Export. Your movie will begin exporting. Depending on the complexity it could take awhile. Keep an eye on the clock, you’ll want to know about how long it takes to export your files. Automator cannot dimiss this dialog with “Watch Me Do”. You will need to add a bit of AppleScript to make that work. You can download my Automator workflow, with the needed AppleScript here. Please note that you will need to adjust the duration that the workflow pauses for during export. Many of my movies exported in just under a minute so I set the duration to 2 minutes just to be sure everything would finish before AppleScript attempted to dismiss the confirmation dialog. Posted May 24th, 2011 in Tutorial. Tagged: adobe, AppleScript, Automator, FLA, flash, JSFL, quicktime, SWF.